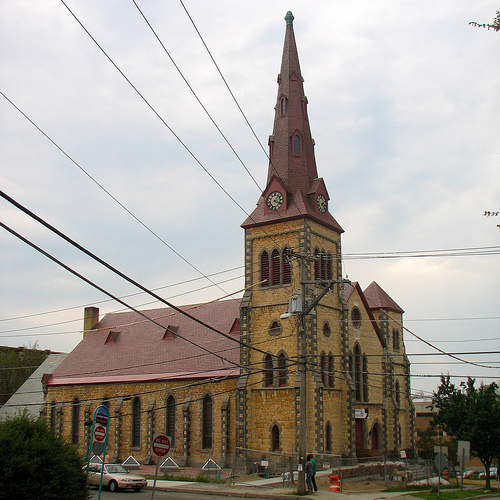 College Street Congregational Church in Burlington, Vermont, used I/E funding to plan for repairs to its fire-damaged steeple.| Credit: Preservation Trust of Vermont. When your historic building is damaged by a storm or fire, it can be difficult to imagine where funding will come from to bring it back to its former glory.The National Trust for Historic Preservation’s Emergency/Intervention (E/I) funding may be able to help. We would love to help save all the old buildings that suffer damage each year, but our funding for emergency purposes is quite limited, so we do have some restrictions. Applicants need to be a Forum-level member of the National Trust, and must be a 501(c)(3) nonprofit organization or a government agency. Like with the majority of the NTHP’s grant funds, E/I funds can only be used for planning purposes. This means that E/I funds cannot go toward the cleanup or bricks-and-mortar reconstruction of a building. Instead we can pay for your organization to bring in professionals, such as a structural engineer, to create a renovation plan for the building. The good news is that since this work probably wasn’t included in your annual budget, we don’t require a cash match for your grant. So what do we consider an emergency? Intervention funding from the National Trust is awarded in emergency situations when immediate and unanticipated work is needed to save a historic structure. In general, the event that causes the damage has to have been recent, as in the last few weeks or months, and it can’t be something that could’ve been prevented. 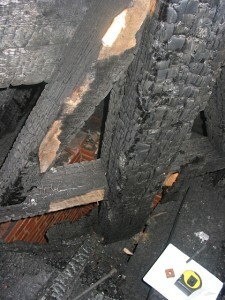 Damage due to a fire, flood, or high winds is a good example. But not every emergency is brought on by a natural disaster. Funding can also be used to support advocacy campaigns in response to pending legislation or development pressures. We’re always happy to talk through your situation and help you if your project qualifies and we have funding available. Those looking for more information on this historic system can check out the June 2014 issue of Timber Framing: The Journal of the Timber Framers Guild, where the structure system is documented and discussed. The College Street Church Restoration Committee is currently considering whether to reproduce the original timber-frame structure or create a modern framework skeleton. The exterior of the historic steeple will be reproduced. The E/I funding, along with other donations and fundraising efforts, has meant that the church has been able to move ahead with the restoration while at the same time continuing its ministry role in the community. And this is exactly what we hope for in our Emergency/Intervention funding program. For more information contact our grants team at grants@savingplaces.org or call 202-588-6277. Further information about grants provided by the National Trust for Historic Preservation can be found here. Diana Maxwell is the associate manager for grants at the National Trust for Historic Preservation.